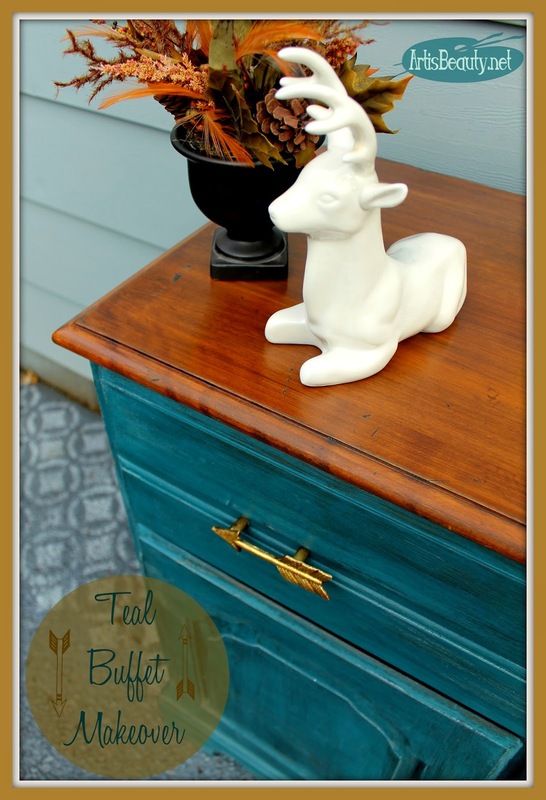 ART IS BEAUTY: Teal Buffet Makeover AKA "THE GOLDEN ARROW"
Teal Buffet Makeover AKA "THE GOLDEN ARROW"
Good first MAKEOVER MONDAY of 2015 my BEAUTIES! Did you all have a great End of the Year? Ours was pretty subdued and that was just fine with me. it was much needed to bring in the new year quietly. One of the last projects I completed before Christmas was this little buffet. I had picked it up from a Salvation army store earlier and I wasn't sure what I wanted to do with it. It was solid but the top was pretty beat up and it had the orange finish that isn't real popular around here anymore. Luckily I had just the thing to transform it. be the PERFECT piece to try it out on. I scuffed up the top with some steel wool and wiped it down and layered on my stain finish. It darkened it up just enough to give it a more up to date look. Then for the base I used some of CeCe's Thomasville Teal. I didn't go crazy being perfect on the base because I knew I was going to distress it and use some light medium wax to give it some age. from Hobby Lobby you know how DIFFICULT they were to find. These were the only 4 I was able to get. Luckily I made them work for this piece. would give it the look that I wanted. Honestly I don't know HOW many trips I took to try and find these pulls. I knew when I found the four that was all I was going to find. I think you will agree, all the hunting for the hardware was worth it. They helped transform the piece. I hope you enjoyed the latest Makeover Monday of 2015. Don't forget I also have a new LINK party going for the new year. Seeing what all of you were up to was always a Highlight of my week. but I need YOUR HELP doing it.